In Thawing of Ties, U.S. 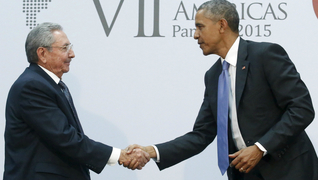 Releases Cuban 5 Members, Cuba Releases USAID Subcontractor Alan Gross | Democracy Now! In a reported prisoner exchange, Cuba has released Alan Gross, a subcontractor for U.S. Agency for International Development, after five years in prison, while the United States is freeing the three remaining members of the Cuban Five — Gerardo Hernandez, Antonio Guerrero and Ramon Labañino. Alan Gross was arrested in 2009 on suspicion of being a U.S. spy after handing out equipment to Cuban opposition groups. The Cuban Five were arrested in the United States in 1998 and convicted of conspiracy to commit espionage. The Cuban intelligence officers say they were not spying on the United States, but rather trying to monitor violent right-wing Cuban exile groups responsible for attacks inside Cuba. 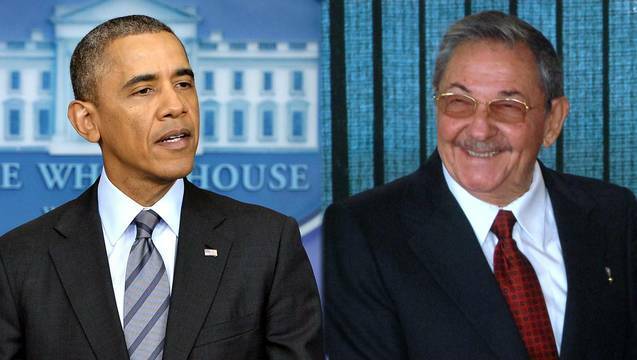 Both President Obama and Cuban President Raúl Castro are scheduled to make statements today on U.S.-Cuban relations.